901 G St. NW, Washington, D.C. 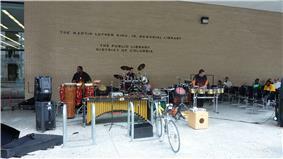 The Martin Luther King Jr. Memorial Library (MLKML) is the central facility of the District of Columbia Public Library (DCPL). 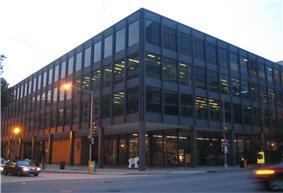 Ludwig Mies van der Rohe designed the 400,000 square foot (37,000 m²) steel, brick, and glass structure, and it is a rare example of modern architecture in Washington, D.C. 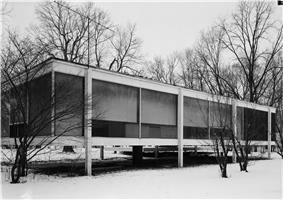 This library was Mies's last building, his only public library, and his only building constructed in Washington, D.C. The building was completed in 1972 at a cost of $18 million. Maintenance was then somewhat neglected and there were problems with the HVAC system. DCPL has recently restored lighting on the entire first floor. DCPL has also recently completed elevator and restroom renovations throughout the building. On June 28, 2007 the District of Columbia’s Historic Preservation Review Board designated this building a historic landmark. The designation, which applies to the exterior as well as interior spaces, seeks to preserve Mies' original design while allowing the library necessary flexibility to operate as a contemporary library facility. It was listed on the National Register of Historic Places in 2007. Named in honor of the American civil rights leader, the building's lobby includes a large mural of Martin Luther King, Jr. by artist Don Miller. Prior to 1972, Washington's central library was a 1903 Andrew Carnegie-funded building located in Mount Vernon Square. That building was used by the University of the District of Columbia, and is currently occupied by the Historical Society of Washington, D.C. The Martin Luther King Jr. Memorial Library houses several of the library system's special collections. The Washingtoniana collection includes books, newspaper archives, maps, census records, and oral histories related to the city's history with 1.3 million photographs from the Washington Star newspaper and the theatrical video collection of the Washington Area Performing Arts Video Archive. The Black Studies Center was established along with the MLK Library in 1972 to collect documents related to the African diaspora focusing on African American culture. Libraries on the National Register of Historic Places in Washington, D.C.
^ Weiss, Eric M. (March 16, 2006). 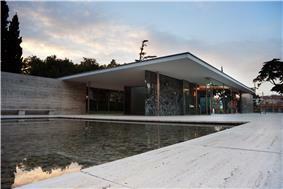 "Outdated Eyesore or Modern Masterpiece?". Washington Post. p. DZ01. ^ a b "Special Collections". D.C. Public Library. Retrieved 2009-12-14. Regularly scheduled programs are posted in Teen Space. Teens are invited to participate in video games, card games and board games. With permission from the library staff, teens are welcome to bring their own game consoles. The Teen Space staff is readily available to assist with questions, book selection and library tours. Visit and enjoy a movie on our flat screen TV, use any of our 20, fully loaded iMac computers or have a study session in our meeting room. Teen Space is also equipped with a recording studio. The studio’s free to teens who have completed the mandatory orientation session. The collection in Teen Space is primarily composed of recreational reading material. Patrons can find award winning fiction titles, popular non-fiction, graphic novels, magazines, audio books and music. The library also offers an online collection of downloadable audio books, movies, music and language learning software. Located on the second floor of the Martin Luther King Jr. Memorial Library, Teen Space is designed to meet the academic and recreational needs of young adults age 12-19. Staff is available to assist teens, teachers, care providers and parents.